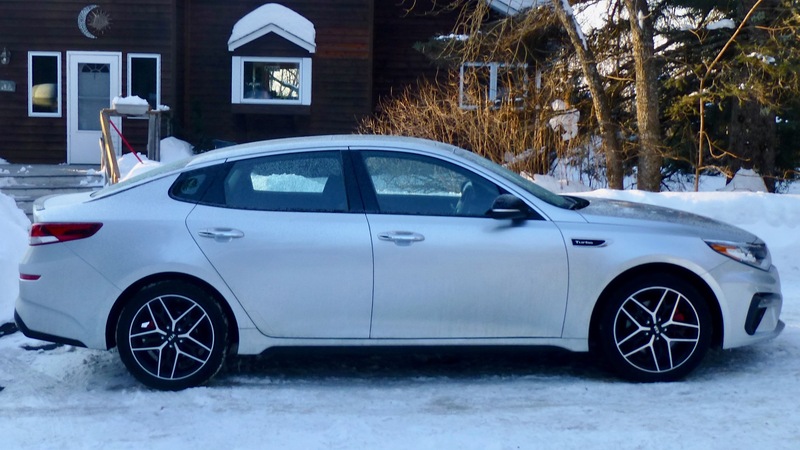 Sleek lines make the Kia Optima SX Turbo stand out from the midsize sedan crowd. One of the more intriguing things about the contemporary auto business is the styling duel going on between South Korean partnmers Kia and its parent company, Hyundai. It started in 2011, a few years after Hyundai agreed to take Kia under its expansive corporate wing, and it was the watershed year when Hyundai came out with a new Sonata that had a new frame, a new and contoured body, new suspension, and was powered by new engine technology, with new, house-built 6-speed stick and automatic transmissions. Shortly after the Sonata’s introduction, Kia brought out its sister ship, a new Optima. Without the Sonata’s contours in the body, the Optima was sleeker and to some, more stylish. I thought it resembled the luxury Jaguar sedans more than the closely related Sonata. With Kia able to share Hyundai technology, the two companies also built parallel smaller sedans and SUVs, as well. Sporty but businesslike driver view. Time has evolved since 2011, and the Optima and Sonata continue to be the most recognizable vehicles for comparison. The corporation had hired Peter Schreyer away from Audi to design the Kia models, and he was so successful some Hyundai executives thought they should share his design expertise, so Schreyer was given the chore of being chief designer of both brands. A wise choice was that he was charged with making the similar models distinctly different, while still sharing drivetrains and platforms. 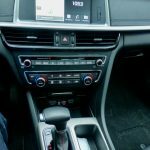 Jump ahead a couple styling generations and the 2019 Sonata is a very nice, refined sedan, which seems to have found a sweet spot after it was first smoothed out and then contoured again when sales slipped. 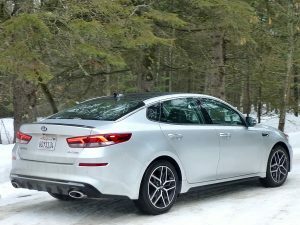 The 2019 Optima — which I recently test-drove for a week — is a perfect example of how effective the two companies’ strategy has worked out, with its smoother and sleeker lines refined into a unique appearance. Hyundai has jumped ahead with advance displays of its 2020 Sonata, which takes on an entirely new and bold appearance that could be a definite jump into a new generation. Meanwhile, the 2019 models of both cars are selling well right now. With the auto industry suffering a downturn in recent months, sales of the 2019 Sonata was up slightly, but the Optima has risen 10 percent for the first quarter of 2019, amid negative figures from almost all non-truck rivals. One thing Kia shares happily with Hyundai is a now-traditional ability over-achieve, building cars and SUVs that seem to be worth more than their selling prices — a particular asset in this era of over-priced vehicles in virtually every showroom. All the lines that flow along the Optima’s body come to a favorable meeting at the rear. 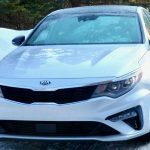 The 2019 Kia Optima SX Turbo I test drove certainly lived up to that reputation. To start with, it was powered by a well-suited displacement compromise as the middle unit of the corporation’s most identifiable 4-cylinder engines, the 2.0-liter, which is between the 1.6 Turbo below and the 2.4 above. The 2.0 is a solid engine, and when equipped with the turbocharger, as the test car was, it is hot. The 2.0 turbo turns out 245 horsepower, a lot for a modest-sized 4, thanks to direct injection and the turbocharger, and it also provides 260 foot-pounds of torque, the thrust that launches you from a stop or whenever you need an immediate surge. The 6-speed automatic transmission built by the company remains a standard of the industry for being light, efficient and smooth-shifting. It now has a has evolved also, and along with the 6-speed automatic, which came in the test car, or you can opt for the 7-speed dual-clutch automatic. The front-engine, front-wheel-drive Optima also has gained a suspension refinement that is perfectly matched to the stronger and more-rigid platform that has taken on increased use of high-strength steel, from the steel plant that makes Hyundai the only manufacturer that owns its own steel making capability. 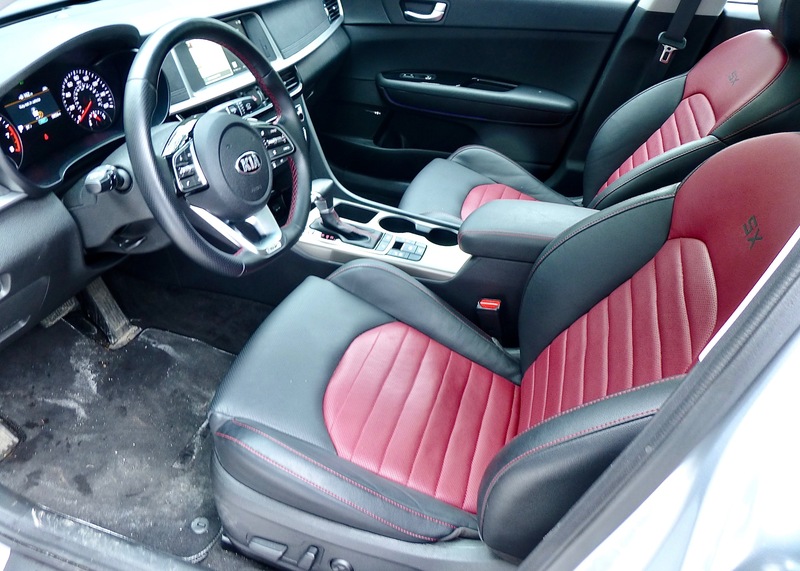 Two-tone leather seats and an array of efficient controls enhance Optima’s interior. 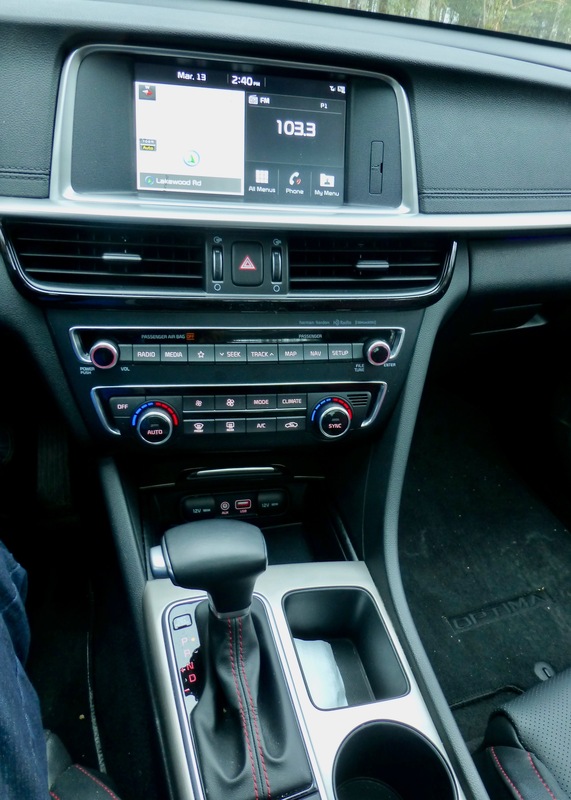 The SX Optima, loaded, has a base price of $31,900, and as-tested it’s $32,920, indicating its bright ideas are not limited to all those automatic LED headlights, as well as LED foglights, taillights, and daytime running lights. The Hyundai-Kia partnership has done its homework and keeps passing its final exams with top grades, having moved up near the top of initial quality figures. The Optima, like the Sonata, has had the proper elements for creating handling superiority, but it’s sort of like building a Formula 1 race car — you can supply all the right pieces, but it takes a highly skilled engineer to coordinate them into the proper arrangement. 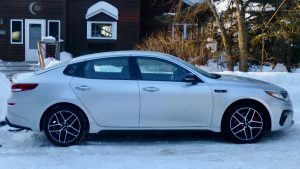 After several tries, the new Optima seems to have taken full advantage of the technology and engineering knowhow to handle very well. What is a more subtle but very effective addition is the electronic expertise is the inclusion of such safety elements as lane departure alert and warning. 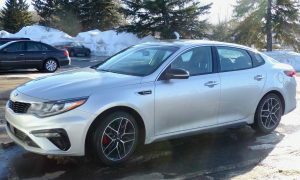 Taking it one step farther, the Optima benefits by the electronic adjustment to the lane-keep assist and to the upgrade to sporty handling-steering-stability. Together, they make the good-handling Optima take corners and ride with smooth comfort but also sporty precision. There have been a few ways Kia has branched away from Hyundai. Both have compact and subcompact sedans and hatchbacks, and both have larger and more luxurious sedans, as well as an array of SUVs that ranges from compact crossovers to midsize and full size, with both venturing upward to what we might have to call oversize. 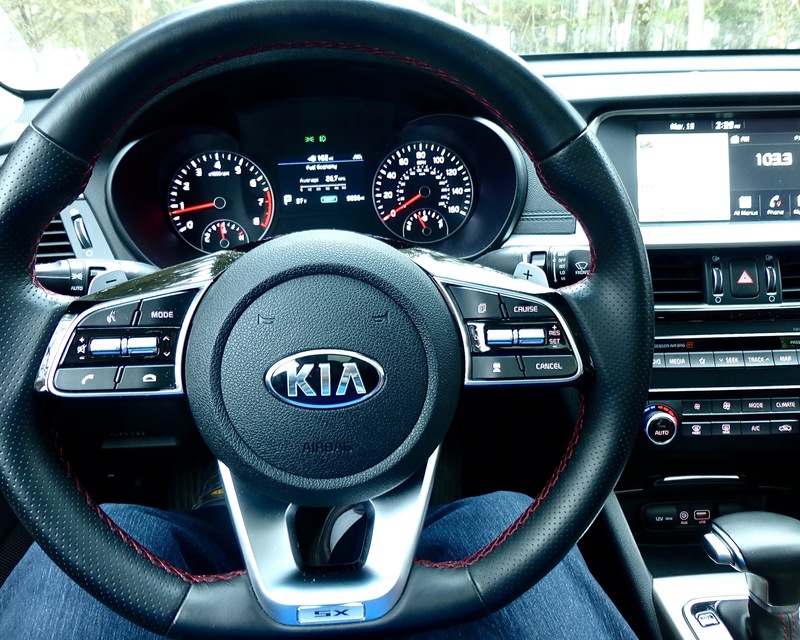 Kia drew rave reviews when it came out with a high-performance sedan — the Stinger — that competes right well with more expensive German standard-bearers from BMW and Mercedes. Kia also has the Soul, the squarish econobox that surprised even the company with its success. Hyundai counties with the Ioniq, a technical marvel that has hybrid, plug-in hybrid, or all electric powertrains. And with Hyundai’s new Kona compact SUV coming out in all-electric form, it is obvious what direction the corporation is going. Sleek, iuninterrupted lines differentiate FWD Optima SX from its Sonata cousin. 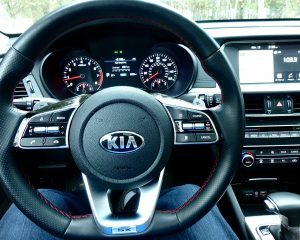 For now, however, the Optima displays all the right stuff. with fuel economy that can top 30 on the highway, if you keep your foot out of the turbo’s upper reaches, and the added luxury of the red quilted two-tone leather bucket seats, along with the touch-screen for connectivity features, and an enormous sunroof that is so large it has its own shade that can be power-maneuvered. 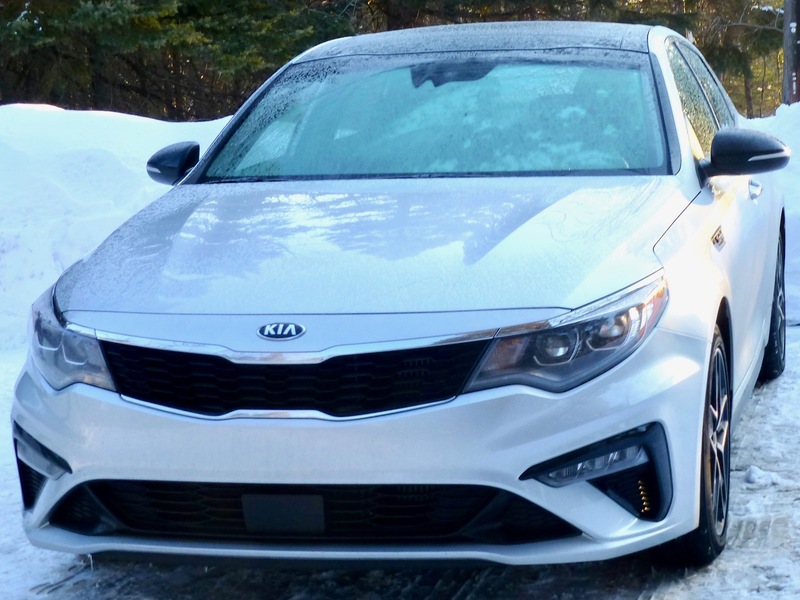 Traction control, stability control and a stability management system, augmented by hill-start assist, means the Optima does a good job on snow and ice, although the “D” shaped steering wheel serves notice of the sporty intent of the car. Nav screen, console controls easy to operate. Kia’s signature grille leads the Optima. Maybe both extremes work, because in the week after I drove the car, temperatures along the North Shore shot up to the 50-degree range, which was enough to bring a few black bears — as well as residents of Duluth — out after a long winter of hibernation. Sportiness, luxury, and the ability to change seasons. Not bad.